During the Weimar Republic in Germany (1919 - 1933) the shortage of affordable residential housing, made social housing one of the priorities of communal politics. The City of Dessau took advantage of the expertise of the Bauhaus which had previously moved to Dessau and commissioned the Bauhaus director Walter Gropius to build a housing estate with 314 single-family houses in the suburb of Törten. A key element for Gropius was the rationalisation of all construction processes under the primary consideration of reducing costs. The individual assembly of the prefabricated building components was also intended to fulfil the specific wishes of the residents. The Dessau-Törten estate includes the Balcony Access Houses and an experimental metal house. The Törten Estate was constructed over three main building phases. there were three different house types with surface areas of 74 m², 70 m², and 57 m², built in different variants. To keep living costs low, the houses were conceived with gardens where the inhabitants could grow vegetables and fruits and keep small livestock. 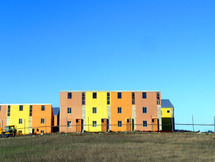 The houses were combined in groups of four to twelve units. The facades are divided by vertical and horizontal rows of windows; the interior colour scheme gave preference to light colours. The construction was carried out under the principles of standardization and cost-efficient work routines which were modeled after assembly line mass productions in the United States. The inhabitants who were also owners of the houses were indifferent towards the Bauhaus architecture, but they heavily criticized the construction defects which caused the overall construction costs to rise. Over time, many houses suffered. The owners often changed the structure, facades and interiors of the houses to accomodate their personal tastes or convenience. 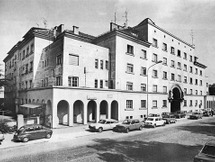 In 1993 however, the City of Dessau, acquired the house on Mittelring 38 and restored it to its original state. Today it is open to the public and can be visited.